German landscape- and portrait-painter; born in Berlin April 25, 1811; died there Oct. 20, 1882. He studied under Wach at the Düsseldorf Kunstakademie, and under Delaroche in Paris. Having completed his studies at the latter place he traveled through Europe, North Africa, and Asia Minor, returning with more than a thousand landscape-studies and over three hundred copies of portrait-paintings from foreign art-galleries. From 1844 to 1855 Jacob lived in London; he then visited Vienna, where he painted the portraits of several prominent men, among whom may be mentioned the princes Metternich, Schwarzenberg, Liechtenstein, and Lobkowitz, and Count Kinsky. 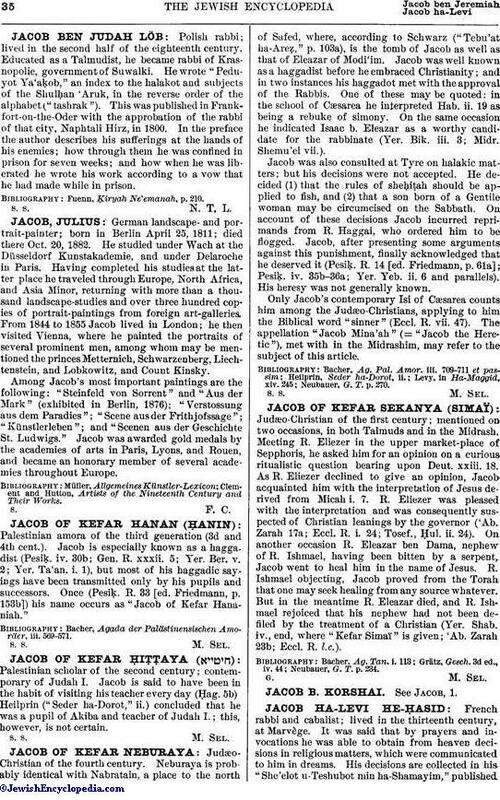 Among Jacob's most important paintings are the following: "Steinfeld von Sorrent" and "Aus der Mark" (exhibited in Berlin, 1876); "Verstossung aus dem Paradies"; "Scene aus der Frithjofssage"; "Künstlerleben"; and "Scenen aus der Geschichte St. Ludwigs." Jacob was awarded gold medals by the academies of arts in Paris, Lyons, and Rouen, and became an honorary member of several academies throughout Europe. Clement and Hutton, Artists of the Nineteenth Century and Their Works.